Sports Books titles – the best of all time? The Winter Olympics are not often the scene for British sporting triumphs. At this year’s Olympics we have 4 medals to date, one of which is gold. We may possibly win another medal, which would make the Pyeongchang Olympics our most successful Winter Olympics ever. We have, however, managed a few sporting coups at the Winter Olympics over the years. One of the greatest and most surprising might be Britain’s gold medal at the 1936 Olympics in Germany. The British men’s ice hockey team beat the then reigning champions, Canada, that year. Canada had won the event for four preceding, consecutive Olympics. Britain had, in fact, a spectacularly successful ice hockey team at the time. It was the first team to become Olympic, World and European Champions, all in the same year. 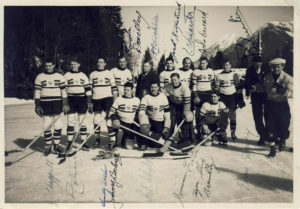 The 1936 Winter Olympics was notable in its own right. Held in Garmisch-Partenkirchen in Germany, it was the last time that a winter and summer Olympics was held in the same country in the same year. Hitler was, of course, Germany’s leader at this time. Months before the winter games an English reporter visited Garmisch-Partenkirchen. He saw several signs, saying ‘Jews not wanted’ and ‘Jews not allowed’ in the village. He took a photo of one of them above the Partenkirchen ski clubhouse. The photo was published throughout the world. A movemement formed in the US to boycott the Garmisch-Partenkirchen Olympics. It threatened the entire German Olympic Project. Germany could not risk countries pulling out of their planned Olympics showcase in Berlin months later. So Berlin ordered all anti-semitic signs and posters removed in Garmisch-Partenkirchen and presented themselves to the outside world as a ‘friendly dictatorship’. Their ice hockey captain was , in fact, Jewish, the only Jew to represent Germany at the Games. The British ice hockey team even performed a Nazi salute during the Games out of ‘respect to their hosts, the German People’. Of course ice hockey at the Olympics has the power to surprise in 2018 too. The appearance of a united North and South Korean women’s ice hockey team has definitely earned the term ‘historic’. They may not have won any medals – or any games! – but they certainly won the prize for most rapturous and warm reception at this year’s Olympic Games. Long live Olympics upsets and surprises – they’re a huge part of the Games’ appeal.